Steve G. Jones achieves AMAZING and LASTING results!!! Hypnosis is the easiest way to affect change in your life because the positive messages go straight to your subconscious mind effortlessly so you can accomplish your goals and reach for the stars!! All you have to do is listen to the Discover the Peaceful Outdoors Hypnosis MP3 at night as you go to sleep!!! You’ll hear soft music, the gentle sounds of the beach, and the soothing sound of Steve G. Jones’ voice all working together to bring about positive changes in your life easily and naturally. Steve G. Jones has been helping people improve their lives with hypnosis for over 17 years…now it’s time for him to help YOU… don’t wait, do it NOW !!! you’ll be glad you did. See you at the top! Do you ever wish you were more in tune with the outdoors? If you wish to learn more about nature, then I encourage you to discover different places near your home or in your town so that you can explore everything that nature has to offer. No matter where you live, there are beautiful places waiting to be explored by you. It does not take much effort to appreciate the outdoors. Perhaps you could go to a nearby park and walk through the different pathways. While outdoors, you should try to clear your mind and heighten your senses to take in your surroundings. The outdoors is a perfect place to relax, meditate, and take time out for yourself. When you are outdoors, make sure that you take in the different sights, sounds, and smells. While focusing on your surroundings, you will realize that Mother Nature is beautiful and peaceful. My Discover the Peaceful Outdoors Hypnosis MP3 session will help! And as you continue relaxing deeper, deeper, and more deeply relaxed you realize that you want to be more in tune with the outdoors. Soon, you will realize that nature welcomes everybody and you will come to enjoy the peaceful outdoors. You become very interested in the world outside your home. Perhaps you do a little research and find out what parks are in your area or maybe you find some nature trails. You become interested in seeking peacefulness of the outdoors. Now imagine that you have found a very peaceful place in your town. Perhaps you are surrounded by trees as far as you can see. Or maybe you are in a wide open field. Perhaps you are on a river or on a lake or on a mountain. Whatever place you would like to imagine, go ahead and imagine it now. What do you see around you? Try to capture the images of the different plants you see around you. Perhaps you see different animals. Really take in your surroundings. What does the sky look like? What is the color the sky and are there clouds out? What sounds do you hear? Perhaps you hear the sound of wind whistling through bushes or trees. Perhaps you hear sounds coming from different birds and other animals. Do you hear a body of water nearby? Or maybe it is completely still in your outdoor world with no sounds at all. Now take a moment to breathe in and out. As you relax inhaling in and exhaling out, notice the smells around you. What do you smell? Perhaps you smell the soil or the bark of a tree or a nearby campfire. Take a deep breath in and as you relax, absorb the smell of nature. Now take a moment and notice how being outdoors makes you feel. Perhaps it is warm where you are and the sun is shining. Or maybe it is cold and you are walking through snow. Whatever nature makes you feel, realize this and turn it up. Outdoors makes you feel relaxed and peaceful. It is a way for you to escape from everyday life. You can create whatever world you would like to be in while you are outside. You deserve peace and quiet and the peaceful outdoors gives you that. Each time you go out into nature, you appreciate it and you realize how great the outdoors makes you feel. Imagine yourself taking a casual walk on a nature trail in your area. You allow your senses to open and absorb all that you are experiencing. Your eyes see everything more clearly and in vivid colors. Your sense of hearing is heightened and you are able to hear all animals and insects. You breathe in your surroundings and as you do, you feel a sense of calmness rush through your body. You have a new found appreciation for the outdoors. You breathe in and out again, deeply, you enjoy the smell of the outdoors; this calms you. You feel so relaxed and peaceful while outdoors. Now I want you to imagine that you brought a blanket with you and you come to a particular area that you enjoy. Imagine getting out that blanket, unfolding it, and laying it down on the ground. You sit on this blanket and you use this time to reflect on yourself and the outdoors. Perhaps you are sitting with your legs folded, in the lotus position. Perhaps you close your eyes. As you close your eyes, you take a moment to enjoy the peacefulness of the outdoors. You begin to realize how soothing and enjoyable nature is. You are sitting up tall and you focus on relaxing your entire body. You relax your entire body. Focus on your head. Ease the muscles in your temples. That’s right, your head feels good. Now open your mouth just a little and relax your jaw. Let all tension disappear. Roll your neck to both sides and let all the muscles in your neck and upper body relax. Work your way down through your arms. Let your shoulders, arms and hands go limp by your side. Focus on your lower back and stomach area. Feel as each inch relaxes. You feel good. Your upper body is at ease. Now focus down to your hips and buttocks; all tension is released. Go further now. To your thighs; let them relax and go limp. You are very relaxed on the blanket surrounded by the outdoors. Now focus further down on your body to your knees, calves, and shins. Let them relax. You move your ankles slightly so that there is no tension in them. That’s right, feel all tension leave your legs. That feels good. Relax the arch of your foot and wiggle your toes. Your entire body now is relaxed. You are now more relaxed than you have ever felt before. You sit on the blanket, your body completely at ease. You feel the warm air rush over you. Go ahead and open your eyes. Look at all the beautiful things nature has to offer. You are completely at peace with yourself and with nature and that feels wonderful. Nature and the outdoors can have a major impact on your well-being. We need to spend time outside and enjoy time with nature because it is relaxing and can improve your overall outlook on life. 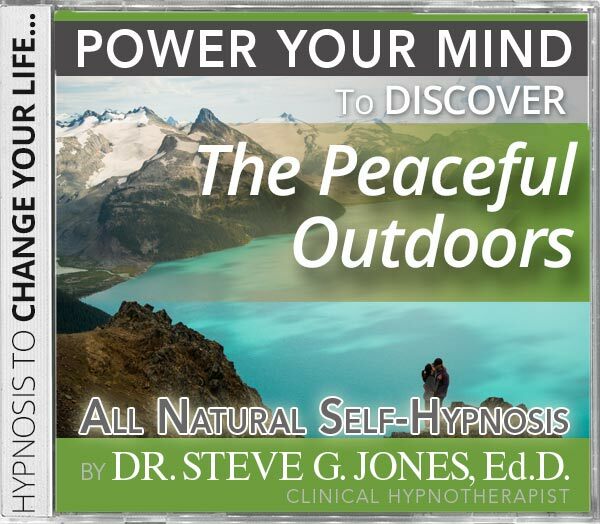 This powerful hypnosis program will help you discover the peaceful outdoors and feel connected with nature. 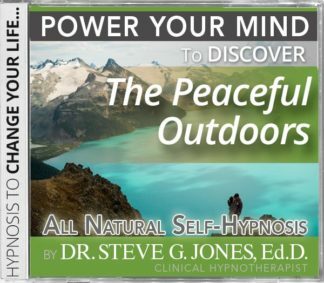 The Discover the Peaceful Outdoors Hypnosis MP3 download will encourage you to spend time outside and participate in outdoor activities. This hypnotherapy session will help you realize how important it is to spend time outside. Discovering all that nature has to offer is a never ending process. Nature has so much to give back to you. And you can take it all in with this self-hypnosis MP3. We suggest that you listen to this Discover the Peaceful Outdoors Hypnosis MP3 recording for 21 nights in a row before going to bed. As you continue to listen to it night after night, you will feel motivated and encouraged to discover what nature has to offer. You will want to spend more time outside. You will notice things in the peaceful outdoors that you never noticed before. Your life will be greatly enhanced by this hypnotherapy program!